Communicating with empathy consists of six sessions that have been developed to promote sensitive and effective communication in end of life care. Each session offers valuable, interesting and accessible learning that will be useful for informal carers, agency and care home staff, healthcare assistants and other staff providing end of life care. Each session is designed to take 20-30 minutes to complete and the sessions can be completed in any order. The content includes interviews with professionals, patients and family members, video clips of simulated conversations and interactive exercises and quizzes. At the end of each session learners can print or save a certificate which summarises the essential learning points. 3. What do we mean by body language? If you already have an account with e-LfH, then you can enrol on to the Communicating with Empathy programme by logging in to the e-LfH Hub, selecting My Account > Enrolment and selecting the programme. You can then access the programme immediately in the My e-Learning section. To register for the Communicating with Empathy programme, select the ‘Register’ button in the top right hand corner of the page. Select the option ‘I am a care home or hospice worker’ then enter your care home / hospice name or postcode and select it from the options available in the drop down list. Finally enter your care home / hospice registration code and select ‘Register’. You may need to see your employer to get this code. Access to e-LfH content is available to all social care professionals in England whose employers are registered with the Skills for Care National Minimum Data Set for Social Care (NMDS-SC). Every employer providing NMDS-SC workforce information to Skills for Care has been given a user registration code for their staff. This code enables you to self-register for access to Communicating with Empathy. Please contact your employer for more details about the registration code. For information about registering your organisation with the NMDS-SC your employer should access www.nmds-sc-online.org.uk or contact the Skills for Care Support Service on 0845 8730129. 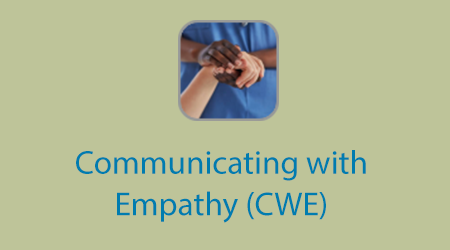 The Communicating with Empathy programme is also available to NHS healthcare staff via the Electronic Staff Record (ESR). Accessing this e-Learning via ESR means that your completions will transfer with you throughout your NHS career.